Like with most products, we understand that customers often want to try before they buy. That’s why we have our purpose built furniture showroom, making it easy for customers to sample prior to making a purchase. This helps give customers some peace of mind that you’re know exactly what you’re buying. Plus sampling our furniture can also help you to match your colour scheme or current decor perfectly. We have a few easy ways that you can do this and we’re on hand to help you with the most convenient method for you. First of all, you can visit our furniture showroom, located in Handforth, Cheshire. It’s easily located close to Manchester airport, and only 10 minutes from the local train station. Our purpose built furniture showroom has hundred’s of different contract furniture options for you to try. Plus our experienced sale team will be on hand to offer advice and help meet your furniture requirements. If there is a specific item that you would like to sample, we would recommend getting in touch prior to your trip and booking an appointment in advance. This will ensure that we have the item in stock prior to your visit, and avoids a wasted trip. If you wish to know more about visiting our furniture showroom or book an appointment to visit, you can read more on our website. Alternatively, you can call our sales team on 0161 485 1717. Our furniture showroom is ideal for customers in the early stages of the buying or decision making process. It will allow you to view the entire range and make an informed decision based on your specific requirements. Another option is our furniture sampling service that we offer. We would advise getting in touch with a small selection of models that you’d like to sample and we can arrange for our courier to deliver these to you. We often tend to send out two samples per customer but we can be more flexible depending on your requirements. Of course this service does depend on what items we have readily available in stock, as to whether they can be sent next day delivery but we always aim to get these to you as soon as possible. This service is often preferred for customers who are unable to travel to our furniture showroom. This service is also free, providing that you place an order with Rosehill. Other sampling options alternative to our furniture showroom include, fabric cards and swatches and wooden colours and frame stain samples. Colours can often appear different when viewing online, and if you’re trying to match your furniture to a specific colour, we would always advise asking for some swatches. This is a particularly useful service if you know the model you would like to purchase but you’re unsure on the colour. Furthermore, our team would always be happy to help advise what different fabric types are available and the benefits of each. To read more about our sampling services, click here. Rosehill has been providing quality contract furniture for over 30 years, including reception and waiting room furniture. Our range of waiting room furniture includes a number of different options which are popular amongst professional establishments. Our extensive range of waiting room furniture includes, beam seating, easy chairs and side chairs, coffee tables and other accessories to help complete your waiting room and enhance your space. Whilst most of our furniture is made to order in a large choice of colours, it means that your furniture can be manufactured and tailored to meet your exact requirements. As we consider ourselves experts in not only furniture, but the waiting room sector, we’ve rounded up 5 of our best-selling furniture items that you NEED in your waiting room. Starting with beam seating. We have a varied collection of beam seating options starting with affordable, lower end options, up to a higher end, luxury beam seating. It really just depends on the environment for what you choose. We also have freestanding or fixed beam seating to choose from, all of which can be upholstered in a colour and fabric of your choice. This is ideal because you can choose a colour to match your current decor perfectly. Beam seating is particularly ideal for waiting rooms or reception areas, because they tend to save space, whilst still remaining practical. Plus with our range, you can feel confident knowing that your waiting room furniture will be modern, stylish and durable. Here’s one of our favourite options for beam seating. It’s got a slightly higher price point but it oozes style and elegance. The Rosehill lounge chairs are a stylish and comfortable addition to your waiting room, and may help your customers to feel more comfortable whilst waiting. Most of our lounge chairs do have optional arms for extra added comfort. We think that easy chairs offer a more luxurious seating arrangement, plus we can help you to choose a either a fabric or leather upholstery to match your current interior in your waiting room or reception area. You’ve probably heard us mention this before but we love modular seating! It allows you to creatively use your waiting room or reception space. It’s particularly ideal if you’re looking for a seating solution that offers flexibility, or perhaps your space is somewhat limited? The range includes either single or double seats, or the full sofa model. You can even customise these to a fabric, colour or pattern of your choice. What’s not to love? Although we’re specialists in seating solutions, we can offer coffee tables for your reception and waiting room space. We offer a durable and sturdy frame, in a choice of different wood finishes to compliment your current decor. What’s more, they’re super durable! If you’d like some advice and guidance when it comes to re-designing and customising your recpetion area or waiting room, then our sales team would be happy to help and advise what products would be suitable for your space. Plus, we have a purpose built showroom that we welcome customers to visit and sample our furniture. If you have any enquiries then you can contact Rosehill on 0162 485 1717. The Rosehill offices will be closed from Thursday 20th December, and will re-open Thursday 3rd January. Please ensure that any queries are sent to the sales team prior to the 20th as emails will not be monitored over the Christmas break. From all of the Rosehill team, we wish you a vey Merry Christmas and a happy new year! If your seating is looking a little tired and worse for wear, it might be time to replace it. Old, outdated seating is often less comfortable to sit on than it once was, especially if it has cushions that have become flattened and lost all their support. Scruffy furniture is never a good look. If you want to seat your clients in comfort and style and to present the best possible image for your business, Beam seating can help you to achieve this. 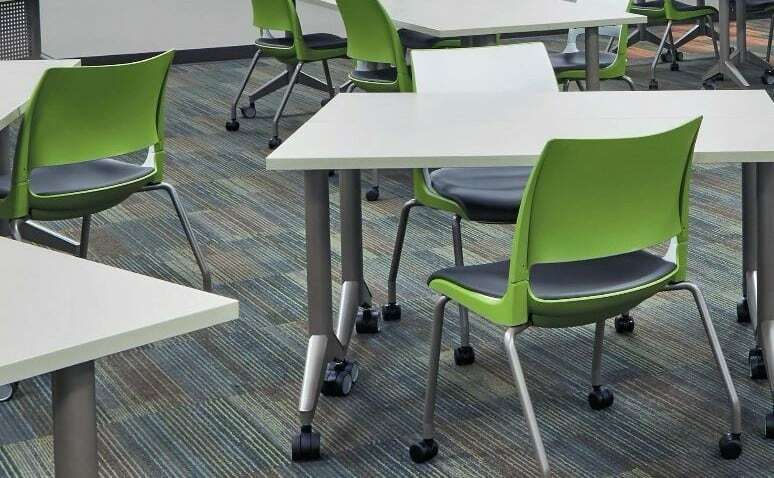 Our seating is available in a variety of styles and finishes and at a number of price points, meaning there is something for every business need. Here are two of our most popular types of seating and how they could work in your business. This is a great option when you need durable seating. 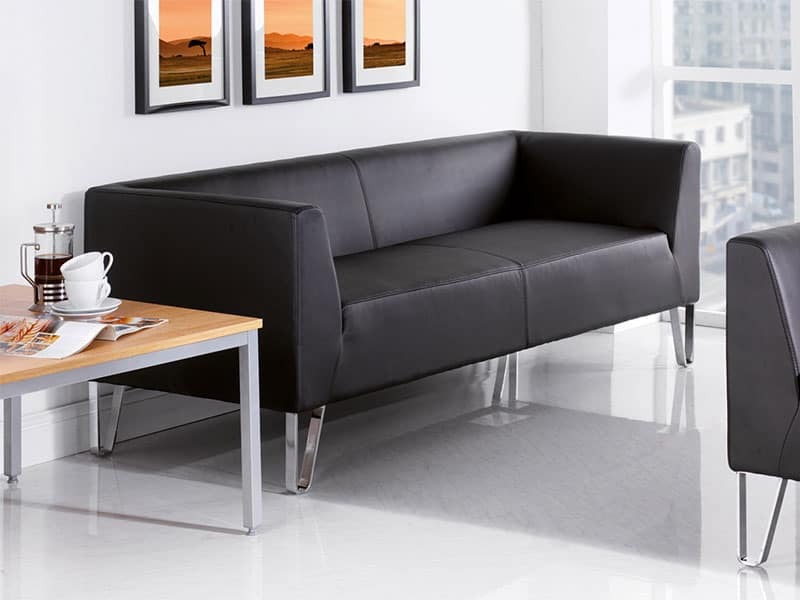 If your seating needs to withstand heavy use and space is at a premium, this stylish seating lets you seat more people in comfort with less floor space. It might be hardwearing, fire-retardant and practical, but it looks really good. It is available in a range of colours, meaning you can choose a shade that complements your existing colour scheme. It is also highly versatile and you can select different beam lengths to fit fewer or more seats as required. This seating is ideal for busy waiting rooms, airport lounges, conference spaces, and a range of other uses. Choose from fabric or tough vinyl, according to your needs, and it will be easy to keep clean and looking good as new. This packs a stylish punch and is ideal for businesses that favour a modern aesthetic. The cut-out back feature not only looks good but is also comfortable to sit against. You can customise both the frame and the upholstery to perfectly suit your company colours. Not only does this seating look great but also it is hardwearing and features a reassuring five-year guarantee. It is perfect for contemporary businesses and looks particularly effective when placed in small but separate groupings. If you are looking into new seating for your business and would like more information, please do not hesitate to get in touch. We would love to hear from you and share our expertise and knowledge! If you manage or own any space where events or meetings are regularly held, you will be aware of how time-consuming setting up and dismantling seating and tables can be. Heavy furniture that’s not suited to being moved around is cumbersome and awkward to move. Larger items of furniture are also difficult to store, causing headaches when you need to clear your events space for a new event. Folding tables are a great alternative to standard tables and can be used for a range of purposes. Here are some possible uses for our popular 6ft folding table range. A 6ft folding table is the perfect size for small meetings. Most 6ft tables will comfortably sit up to eight people, with three along each side and one at either end. There is plenty of space on the table for papers, documents and other equipment, but everyone is close enough to be able to communicate easily. A folding table can easily be put away after the meeting and stacked neatly or rested against a wall. Folding tables are particularly handy for impromptu meetings or for events when more people than originally expected turn up. A 6ft folding table is ideally suited to temporary sales, markets or exhibitions. As our folding tables tend to be lightweight and easy to move, they can be situated exactly where you want them, and it’s simple to move them around if you want to make adjustments at any point during the day. They can also be removed as the day goes on if you need to concentrate items for sale or exhibits later on. Plus, if you need more space than anticipated at any point, you can simply pull out another table to set up alongside the others. Able to seat eight diners comfortably, a 6ft table is the ideal size for informal or informal gatherings. Everyone has enough space without being too spread out to be able to converse comfortably. As the tables are easy to set up, the length of time it takes to get your venue ready is reduced. If you’d like to know more about our 6ft tables or any of our other products, please do not hesitate to get in touch. We’d be delighted to talk you through our various ranges and answer any questions you might have. No one likes waiting, or do they? Depending on your line of business, or the services you provide, you might have a reception or waiting area full of clients, customers or service users. While waiting is often seen as a waste of time and a frustrating part of modern life, there are a few ways in which you can keep your audience comfortable while making their wait as pleasurable as possible. The best chairs for your needs will depend upon who your clients are. if, for example, you run a medical facility and a lot of your service users are elderly or infirm, you will likely need high backed chairs with solid arms to make it easier for people to get in and out of them. If you run a business where most of your clients are younger and only waiting a short time, smart, stacking chairs with padded seats might be an option. Likewise, if the number of people waiting tends to fluctuate dramatically, whether at different times of the day or different days of the week, you might want to make sure you have a back-up supply. A readily available supply of spare chairs, whether stacking or folding to take up minimal space, can be brought out at busy periods. The result? No one has to stand. Whichever seats you choose, make sure they are comfortable to sit on. Padded chairs are the best choice if you have the space and budget, or if you tend to have clients waiting a long time. Alternatively, ergonomically designed seating with smooth, comfortable, moulded seats are a good choice if you prefer minimalist, lightweight seating. You don’t need to go all-out here, but a TV showing a rolling news channel, music channel or entertainment channel, depending on your audience, is a great way to help people wait in comfort and forget just how long they’ve been there at busier times. Waiting areas are notorious for having out-of-date magazines for clients or patients to read, and this adds to the general frustration of your audience. It doesn’t cost much to keep your waiting area well-stocked with a variety of up-to-date magazines, journals or industry-specific publications, and your clients will appreciate the effort. If you’d like to know more about our waiting area chairs, or any of our other products, please don’t hesitate to get in touch. We’d be delighted to talk you through the options and answer any questions you might have. 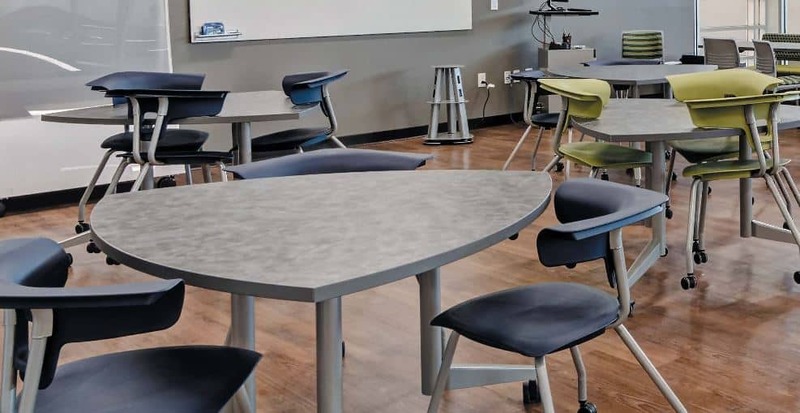 When it comes to creating a comfortable, welcoming and inspirational classroom environment, the right furniture can make all the difference. 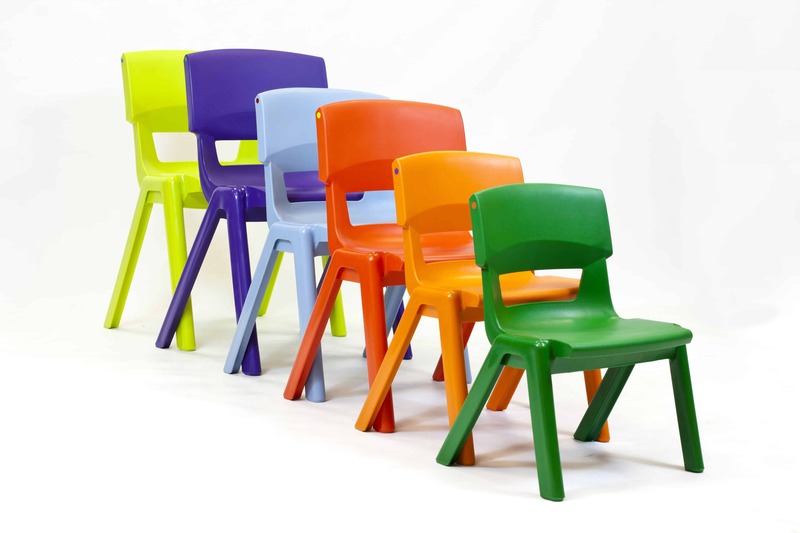 The colourful Postura range of chairs is ideal for pupils of all ages and sizes. Available in adult sizes for older students and several junior sizes for younger children, the Postura provides comfortable seating for everyone. 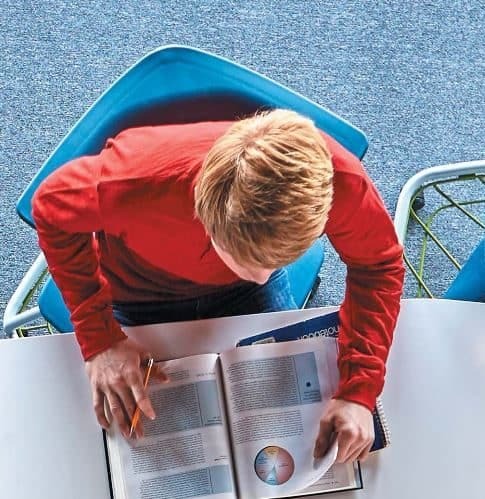 If you regularly need to split pupils into groups for work projects or for other reasons, differently coloured Postura chairs are a simple way to do this. 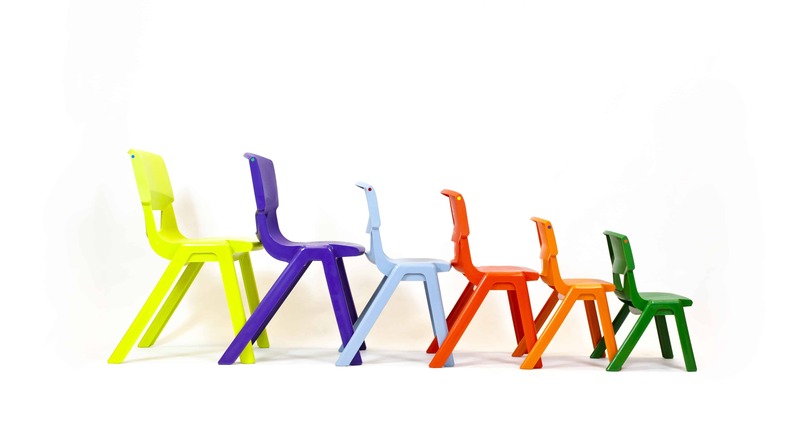 The chairs act as a visual reminder of the different groups and add a fun splash of colour to the classroom. 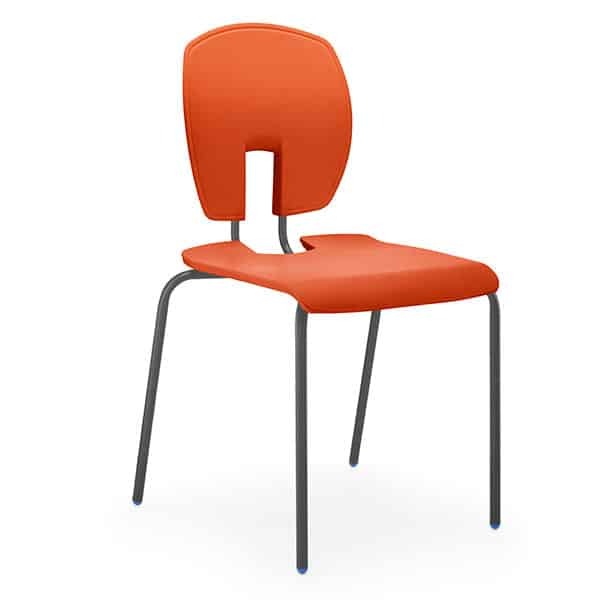 Alternatively, choose chairs in a whole host of random colours to create an appealing and playful look in a classroom for small children. 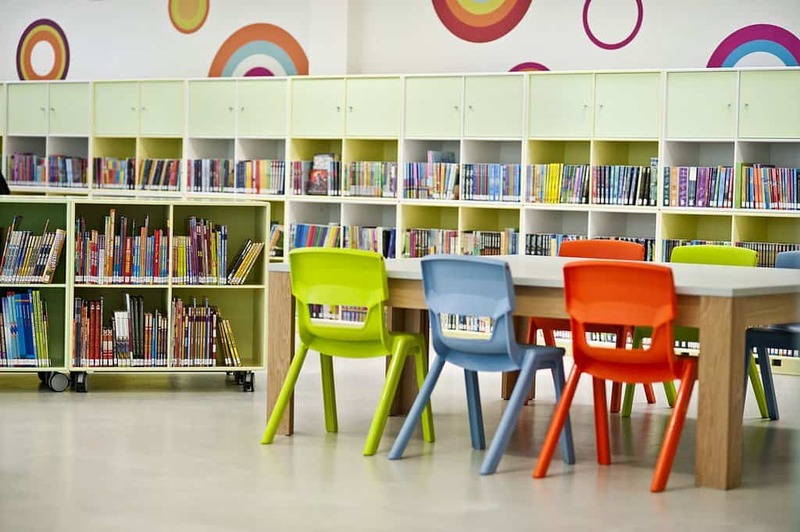 Of course, with so many colours to choose from – including muted neutrals and bright primary colours – it is possible to create any look and feel you want in your classrooms. Postura chairs are designed to be stacked when they are not needed. This frees up valuable space and makes it easy to move chairs out of the way for cleaning or other activities. The chairs can be safely stacked to a height of 12 chairs, which is much higher than many other models. Postura chairs are cleverly designed to provide comfort in all conditions. With ventilated backs that allow air to circulate, they will prevent pupils from becoming hot and bothered during spells of warm weather. They are also shaped with a smooth curve to the seat, making it easy for children to sit right back on the seat or perch on the edge of the chair as they prefer. There is also a ‘waterfall’ edge at the front of the seat, meaning there are no uncomfortable hard edges to press into the backs of the knees. The basic chair model is extremely comfortable; in addition, features such as seat pads are available if required. If you are interested in learning more about the popular Postura range of chairs, please do not hesitate to get in touch. Postura chairs are some of our best sellers, so we know all there is to know about this fantastic range and will be delighted to share our thoughts and advice on the subject! Added extra’s and fix up’s! With the run up to busy festive period we thought that this might be a useful blog post for all types of businesses. We realise that Christmas can be an expensive and somewhat hectic time, leaving little time or budget for refurbs or ordering new furniture and seating. That’s why we thought we’d do a little piece on our range of added extra’s which can be utilised to either make your furniture more flexible, or even give them a quick make-over or refresh. First of all, Rosehill stock and supply a range of different furniture trolleys including chair and table trolleys. If your establishment is a multi-purpose environment, then these can be super useful to move and store furniture when the extra space is needed for other events. Check out the selection here. Secondly, we also offer replacement pad service if you’re seating is in need of some TLC. We have a wide range of different fabrics and colours so that you can ensure your new pads match perfectly to your current furniture and decor, or alternatively you can opt for something completely different, the choice is yours! In fact, just recently we added a blog on how to swap your chair pads, so make sure you have a quick read. Other extras include, keyhole linking devices and caps allowing you to link chairs, foot ferrules to stop chairs from skidding or scratching floors, book boxes and even kneelers ensuring we can meet all of our customer’s requirements no matter how big or small. You can see our full selection of extras here but a member of our sales is always available and happy to answer any queries. 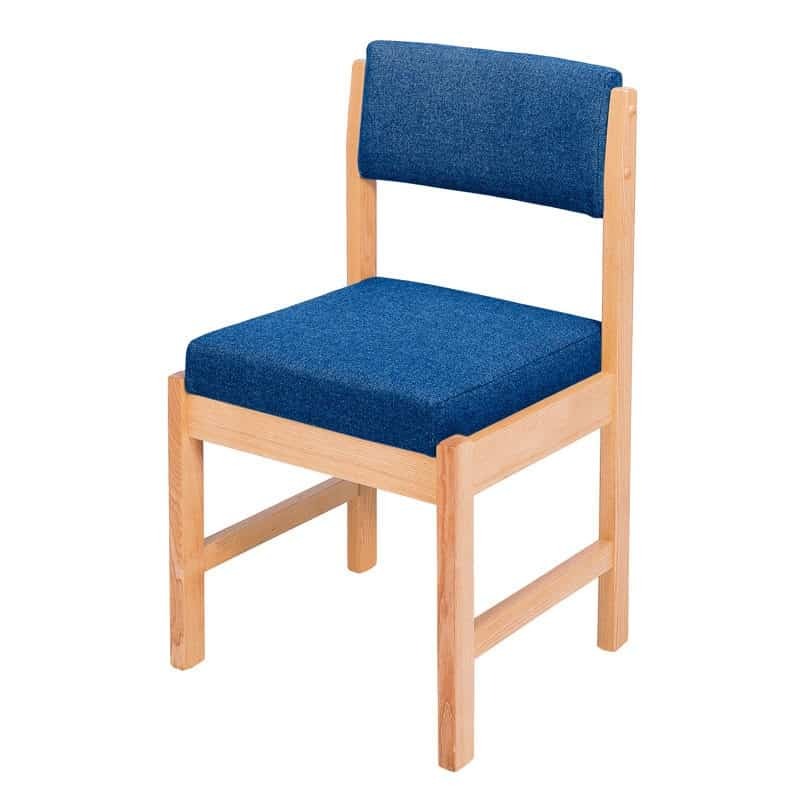 https://www.rosehill.co.uk/wp-content/uploads/2016/02/Linking-on-Cathedral-Stacking-Chairs.jpg 800 800 Steph https://www.rosehill.co.uk/wp-content/uploads/2017/05/rosehill-furniture-logo.svg Steph2018-11-07 18:22:302018-11-07 18:22:30Added extra's and fix up's! The beginning of the year seems to be a busy time with furniture orders for government organisations and other waiting rooms. If you’re thinking of updating your waiting area you may want to read our blog first. We’ve got a few top tips to give your space the ultimate refresh whilst keeping your customers, colleagues and guests in mind. This must be the most obvious point, but comfort really is key. Depending on the type of business you have, your guests could spend some time waiting, so you want to make sure that they’re comfortable for the duration – it’s the least you could do. Make sure that you have enough room and enough seats to sit several people at once. We’d also recommend opting for durable chairs which are suitable for long term use, but still offer comfort with a moulded seat pad. Lack of space or feeling claustrophobic can really make you feel uncomfortable. Make sure you don’t overcrowd the room with furniture, and you choose furniture which is suitable for the shape and size of room. For example, if your waiting room is quite small and square, opt for a small framed chair rather than a bulkier option. We’d recommend Dartmouth stacking chair or the Devon side chair. They’re modern, comfortable and don’t overcrowd a room. The receptionist is the first person guests interact with when entering your office or waiting room. To ensure guests feel at ease, make sure that the receptionist is easily accessible in case of any problems or delays. For example, don’t hide the reception desk around a corner, instead make it easy for people to find. We understand that the reception can’t always be manned, but consider having a phone line which can easily be picked up by a member of staff. Everywhere you go nowadays you can gain access to WiFi. By providing a guest access to WiFi, people can keep themselves occupied whilst they wait. We’d recommend using a separate secure network with a guest password. Simply put up a sign in your waiting area with the credentials. For extra security you could change the guest password on a weekly basis. Why not provide a self-service coffee machine or refreshments counter. You can keep this neatly tucked away in the corner of your waiting area which will keep the place looking tidy but will also keep guests happy. Remember to have a rota of staff to check the area and keep it stocked up and clean. If you need help with finding counters or extra storage units, Rosehill can help. 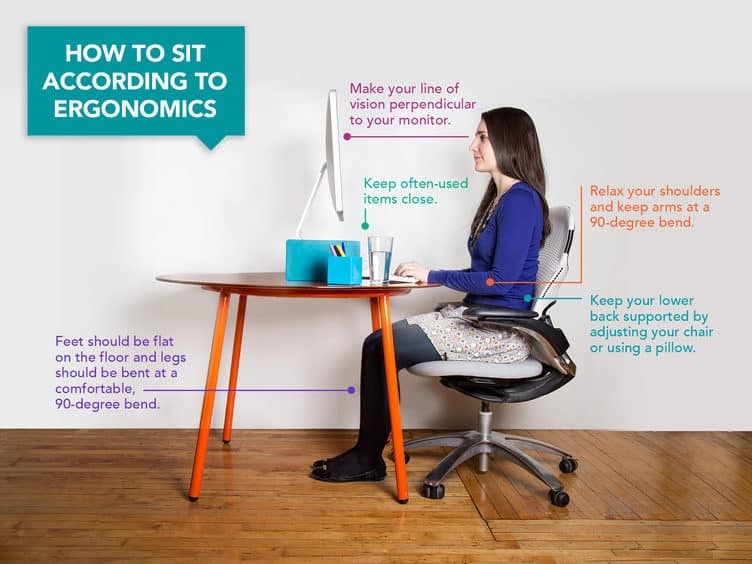 Are you sitting comfortably at work? The average office worker could spend up to 80,000 hours sitting down at work, so as you can imagine it’s a fairly serious question. Are you sitting comfortably? Your office furniture should be specifically designed to give you the support you need whilst at work, and if it doesn’t, in the long term your health is bound to suffer. At Rosehill we strongly believe that comfortable and ergonomic office furniture should be given a higher priority, which is why we offer free and helpful advice. We stock a range of office chairs which offer ergonomic designs to support your back and posture. The best type of office chair is one which is fully adjustable and has support for both your back and arms, meaning you can sit at the right height but you can also rest assured that your wrists are supported whilst you type. Remember when adjusting the height of your chair, the top of your head should be level with the top of your computer monitor, and you should be at arm’s length, ensuring you’re not too close to the screen. 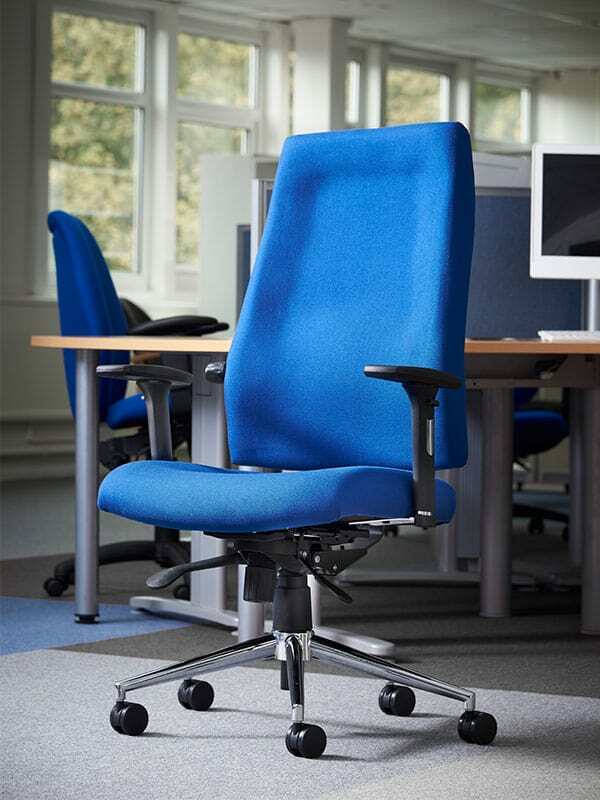 For more advice on office furniture and ergonomic seating, please feel free to give us a call on 0161 485 1717. Our sales team will be more than happy to help. https://www.rosehill.co.uk/wp-content/uploads/2017/05/rosehill-furniture-logo.svg 0 0 Steph https://www.rosehill.co.uk/wp-content/uploads/2017/05/rosehill-furniture-logo.svg Steph2017-10-30 16:08:522017-10-30 16:08:52Are you sitting comfortably at work? Recently, we’ve been trying to give our brand a refresh and update – we want to keep our traditional side, whilst also looking modern and keeping up with new trends. So tell us, what do you think of our new style brochures and posters? Don’t forget that our new brochures will be complete with our newest stock. To order your copy today just call the office on 0161 485 1717.